The Windward Hills Memorial Hal’s Angels had to wait all off-season to get their rematch with the Guam Packers, and that rematch would officially kick-off the GNYFF’s 2018 season. 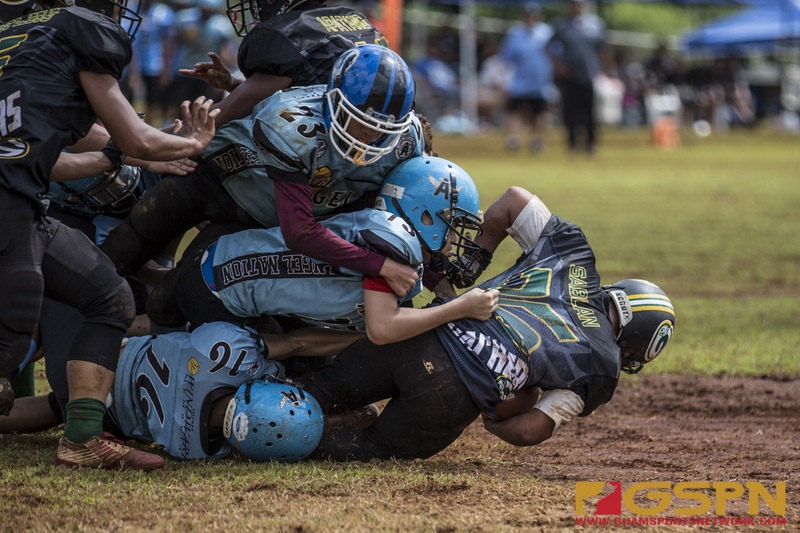 The Angels made a clean sweep of the Packers Saturday at a muddy Hal’s Angels Field, ending the day with a 35-0 win in the Matua Division. The Angels were locked in from the opening quarter as defensive back Marcus Camacho intercepted a pass from Drey Apatang, taking the interception 23 yards into the end zone for the games first score. The Angels defense picked off the Packers on the very next series that led to a 24-yard run by Noah Medler to quickly go up 14-0 through one quarter. “Our defense was key in shutting down their passes. Our blocking on offense was also on point today,” said Angels quarterback Danny Cepeda on the keys to the teams big win. Cepeda would end the day with Wendy’s Player of the Game honors by scoring two of the Angels five total touchdowns. A goal-line run to put the Angels up 21-0 in the 2nd quarter followed by a game-clinching 28-yard score in the 3rd quarter to final the score 35-0 was all in a days work for the son of former football standout Danny Cepeda. “We were really looking forward to this game and we knew it was going to be a tough match since they are the defending champs. We executed the game plan, but we did have minor mistakes out there and we’ll be working to fix that all season long,” added Cepeda. The Angels got a score from Jonathan Sablan in the 2nd quarter on a 20-yard run up the middle, rounding out all the touchdowns from the day. GNYFF action continues tomorrow with the Outlaws visiting the Eagles and the Steelers playing host to the Cowboys. The Angels will host the Raiders next Saturday while the Packers will take on the Outlaws. Raiders def. Broncos in each division.